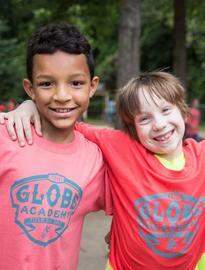 The GLOBE Academy has grown tremendously over the last 5 years because of you and your support. As we enter our 6th year, the GLOBE board of directors, administration, and Parent Teacher Community Council (PTCC) needs your help to continue this growth to propel GLOBE and inspire excellence. Fact: GLOBE is a charter school and needs your support. What we ask is that you give what you can with the understanding that your child’s education is the best investment you will make. There are various ways you can give to GLOBE. Here is a snapshot of what to expect in the 2018-2019 year. With a goal to raise $250,000 and to have 100% family participation by the end of January, this is GLOBE’s largest annual fundraiser. Every unrestricted dollar contributed to the Fund will be used to provide for the outstanding faculty, programs and improved facilities that directly benefit our students every day. Visit the Annual Fund page to give your gift, to learn more about the Annual Fund and how money raised during last year’s Annual Fund was used. At GLOBE, we know that it takes a village to raise our children. Staff gifts support our passionate, hard-working, dynamic teachers and staff who help your child every day. Through these funds, GLOBE families are able to easily show appreciation directly to all the staff who interact with your child(ren). This includes your child’s homeroom teacher, their specials teachers, their teaching assistants -- in short, the many professionals who teach and care for your child every day. Cash gifts are provided through this fund at the winter holidays and at the end of the school year. The funds are collected through a central fund managed by the PTCC. Click here to make your donation today! An evening you won't want to miss! Join us for a night of GLOBE friends, fun, food (and drink!) auction event. This year's auction will be one March 23rd, 2019. Come to the auction and bid on fantastic silent auction items and live auction collaborative art created by our children. The GLOBE PTCC Annual Spring Auction provides support for all PTCC activities throughout the year, including teacher appreciation, resources for the classroom, teacher grants, cultural events, International Fest, campus beautification, science night, and more. This year’s goal is to raise $75,000. Throughout the year, you will also have the opportunity to support GLOBE by shopping through our Royalty Programs (Amazon, Publix, Kroger, etc. ), purchasing fabulous Spirit Wear, attending PTCC spirit nights (super fun! ), shopping at the GLOBE book fair and more. All proceeds support GLOBE! Visit the PTCC Fundraising page for more information. Development Committee Contacts: All major school and PTCC fundraisers are coordinated through GLOBE's Development Committee. Please contact the committee chair Will Acree @ wacree@theglobeacademy.net﻿ or Anita Patel @ apatel@theglobeacademy.net if you have any questions. Interested? No experience is required and tasks can easily be done from home.